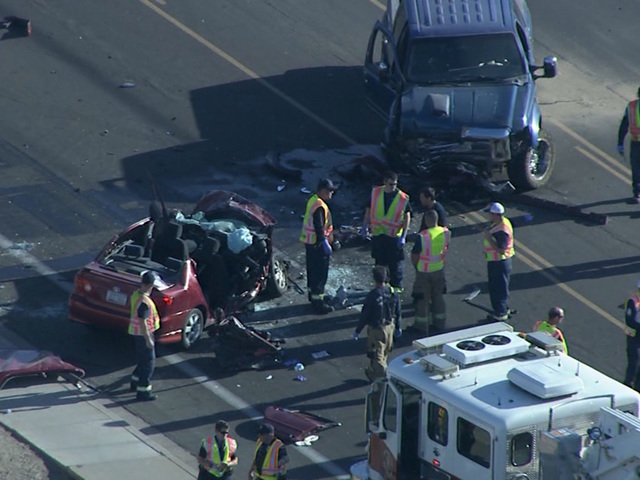 Phoenix, Arizona—Three people have died from injuries they sustained in an accident at 32nd Street and Paradise Lane late Thursday afternoon. Phoenix emergency fire and medical personnel extricated all four occupants of a sedan that collided head-on with a full-size truck. The truck driver sustained only minor injuries. The dead have been identified as the driver of the car, Reshad Lewis, age 34, front seat passenger, Nickole Lambert, age 25, and Shihada Lewis, age 8. The sole survivor is a toddler who was properly restrained in a car seat. After treatment for his injuries, he was released to the custody of his great-aunt. We extend our condolences to the families and friends of the victims and we wish a speedy and full recovery for the young boy.